This medal was awarded to those who saw service in any theatre of war between 5th August 1914 and 31st December 1915, other than those who already qualified for the 1914 Star. After the first Battle of Marne thousands of miles of parallel trenches were dug along the western front . Trench warfare was necessary because of the power, speed and accuracy of the weapons on both sides would have made it impossible to fight a battle in the open. This reproduction 1914-15 Star medal is made from bronzed lead-free pewter. 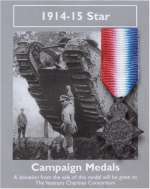 It is supplied on a red, white and blue ribbon attached to a card with an image of a British tank crossing a trench on the front and historical information on the reverse. Pewter 25 pounder gun supplied on a pin with clasp. The information on the reverse of the card describes how different equipment is used depending on the type of theatre of war. A pewter World War I Tommy Helmet mounted on a quality key chain. A pewter Tudor rose supplied on a pin with clasp. The front image shows a Tudor scroll whilst the information on the reverse of the card tells a brief story of the Tudors.